After making waves during its multiple releases in 2010, the Jordan Brand is looking to make another noise this 2011 with the release of a new colourway of the Jordan Flight 45 High that is already hitting strides in the market. 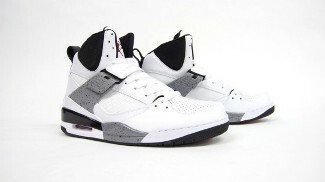 The Jordan Flight 45 High, which was made to pay homage to Michael Jordan’s return in the NBA after a two-year hiatus, will come out in White/Varsity Red-Black-Cement Grey colourway that was clearly derived from its famous sole color. Although we’ve already seen impressive colourways of this shoe before, this new edition is a must buy especially for those who are looking for an elegant basketball sneaker that would also suit your lifestyle needs!